The R-J05 hang tab adheres to the back of the package to provide a clean display of the boxed product. 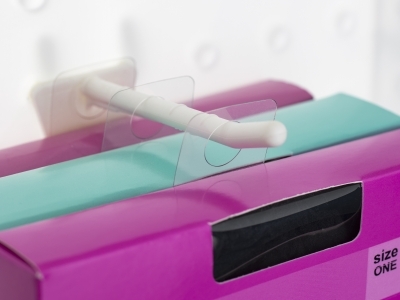 Like most clear hang tabs, the ejected-hole R-J05 allows the product to hang in various locations in the store without blocking any product information. © 2019 Do-It Corporation All Rights Reserved.